On November 16, 1933, the Blue Ridge Parkway project received approval from Congress. After much debate in Washington, the Virginia – North Carolina route won out, completely leaving out the state of Tennessee. Had the Tennessee route been included, the road would have cut through Mitchell County and crossed Roan Mountain into Tennessee. The purpose of the road was two-fold. It was built for leisurely travel, connecting the Shenandoah National Park in Virginia with the Great Smoky Mountains National Park in North Carolina and Tennessee. But greater still was the number of jobs it created during the Great Depression through the WPA and CCC Projects. 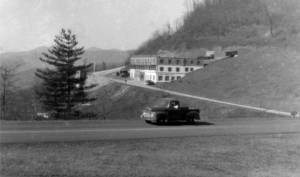 This week’s picture shows the Parkway at Gillespie Gap shortly after it was paved. In the background is the Skyline Inn which was built in 1948 by John Greer. It and the Gillespie Gap Motor Court (later named Mountain View Motel and Restaurant) were the direct result of the roads completion. Today, the Blue Ridge Parkway extends 469 miles through the southern Appalachian Mountains and hosts 22 million visitors per year.